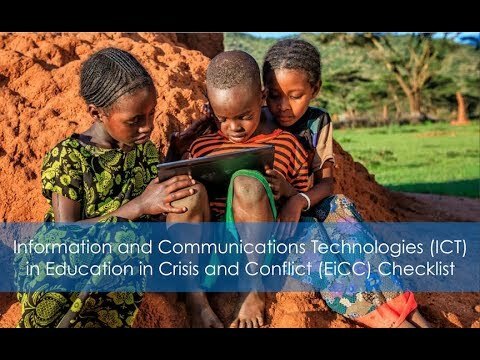 ECCN and INEE’s Technology and Education in Crises Task Team (TECTT) jointly hosted this webcast to introduce a new tool called the “Checklist for ICT Interventions to Support Education in Crisis and Conflict Settings” (or ICT in EiCC Checklist). This information communication technologoy (ICT) tool was developed as a collaboration between ECCN members and staff and INEE TECTT members to help ensure that ICT interventions supporting education activities in communities affected by conflict and crisis are conflict sensitive. Anthony Bloome is the Senior Education Technology Specialist at USAID. He has worked as a distance education specialist at USAID since 2009 where he provides technical advice to HQ, Missions and counterpart agencies regarding the appropriate uses of technology to support quality educational outcomes in developing countries. He is the campaign director for All Children Reading: A Grand Challenge for Development, a global competition to catalyze innovations to advance early grade reading, and is the founder of the Mobiles in Education (mEducation) Alliance, an international stakeholder initiative designed to evaluate and dramatically accelerate the scalable utilization of appropriate technologies to support education. Prior to joining USAID, he was Peace Corps’ technology for development specialist for three years and a distance education specialist for the World Bank in Washington, D.C. and Zimbabwe for eleven years where he focused on technology for health, education, and youth and workforce development among other topic areas. He has a MA in International Telecommunications from George Mason University. James Rogan is the Senior Advisor to USAID’s Education in Conflict and Crisis Network (ECCN), and is Principal and Owner of Exterion LLC, an international development consulting firm. He is a peacebuilding and governance specialist and has worked on education in conflict and crisis for nearly 10 years. He has held senior management positions with the UN and the private sector. His last role was as Chief of Peacebuilding and Recovery for UNICEF in New York. He holds a BSFS from Georgetown University and an MA in International Political Economy from the University of Chicago. Mona Younes is an independent consultant in the field of ‘Education in Emergencies’. She has been conducting consultancies for international organizations (e.g. UNHCR, War Child Holland, Plan International …) in the MENA region. Her passion and specific niche of expertise lies in the area of using Edtech to empower refugee learners. She is conducting currently her PhD research (Lancaster University-UK), aiming to understand the potentials of ICT-based learning in empowering secondary refugee students in Jordan. Mona has a Master degree in Online Education from the University of Southern Queensland. She has been in the field of teaching, teacher training and curriculum design since 1987 and worked in Egypt and Qatar. Simon Richmond is the ICT Team Leader at EDC, where he manages the design and implementation of technology-based interventions for international development and provides STTA to various crisis and conflict settings across Africa and Asia. Dr. Richmond has also implemented, both as Chief of Party and Project Director, national education projects in Ghana, Malawi and Zambia. He holds a Ph.D. in Education Technology from Old Dominion University. Dr. Lisa Hartenberger Toby has more than 15 years of experience managing, implementing, and evaluating formal and non-formal education projects in the Philippines, Liberia, Democratic Republic of Congo, Sudan, Kenya, Zambia, Afghanistan, Nepal, and other countries. Her experience includes educational policy, teacher training, and the appropriate use of education technology. Dr. Hartenberger Toby currently leads the international monitoring, evaluation and research team at Education Development Center, Inc. She also provides technical support in ICT for development for ECCN. Dr. Hartenberger Toby holds a PhD in International Communications from the University of Texas at Austin.